Many products we use for a certain chore can actually have a lot of different uses throughout the home. Check out these 15 ways to use dish detergent that doesn’t include washing dishes. I love everyday products that have multiple uses. One of those products I use all the time is dish detergent. My favorite brand is the one I grew up with, Dawn Dish Detergent. It’s easy to use in a variety of ways and one of the least toxic and abrasive cleaners out there while still being very affordable. As always, various items and people react to products in different ways so always be sure to test any of these tips on small areas before tackling a huge project. Also, be aware that many detergents come in concentrated versions now, which means you can use less detergent for the same power. As I mentioned, I only use regular Dawn detergent, so your results may vary with other varities and brands. You also don’t want to use dishwasher detergent for any of these as it’s made from different ingredients. 1. How to get grease stains out of clothing. Since I cook a lot, I also see my fair share of grease stains on my shirts due to splatter. Unfortunately, just washing them as normal usually doesn’t get the stains out. For a long time, I had my specific beat up shirts I’d only wear for cooking to keep my nicer shirts looking nice. That is until I found out that dish soap does a great job of getting these stains out. Just rub some dish soap onto the stain and let it sit at least a few minutes being washing. 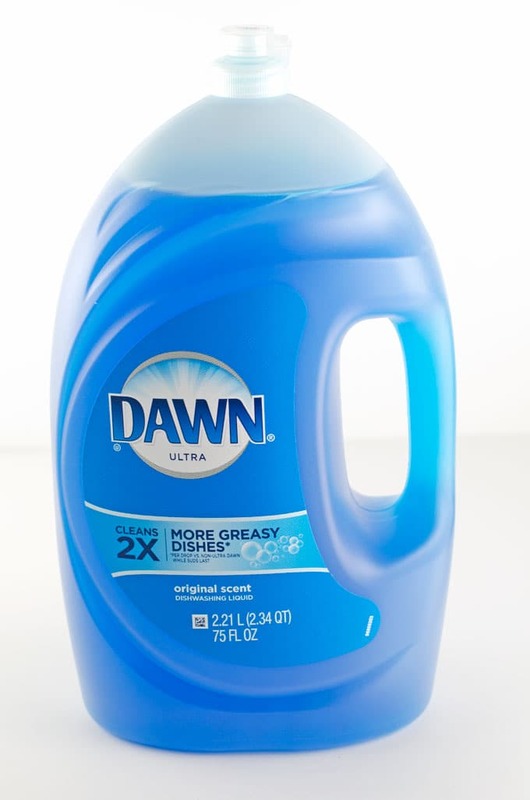 The nice thing is that regular Dawn detergent even works on most whites without any discoloring, but I would always test it out on a hidden spot just to be safe. You’ll also want to wash out the detergent from the clothing first if you’re washing multiple items that have detergent on them so your machine doesn’t have to deal with too many suds. 2. Clean most anything that’s grimy. Cleaning anything that’s greasy and grimy, like a grill, boiled over stove, or greasy range hood is enough to make anyone want to procrastinate until later. 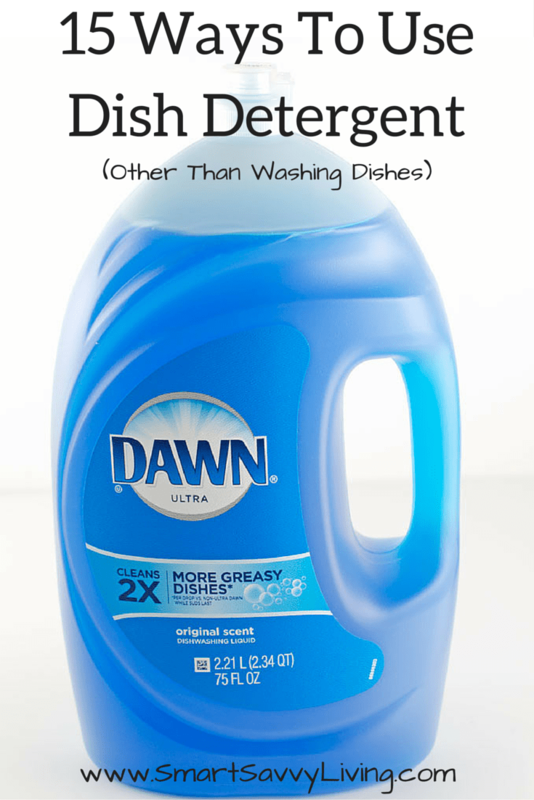 Using a dish detergent like Dawn is a great way to cut through the grease and get grimy things cleaned a LOT quicker. 3. Mopping floors. Since we have pets, I don’t like to use cleaners with harsher chemicals. Because of this, I make a lot of homemade cleaners, even for mopping. You can make a very simple but effective mopping solution with just vinegar, dish soap, and hot water. 4. Make your own bubble solution. Did you know that homemade bubble solution just takes dish soap, glycerin, and water? 5. Bathing pets. Our dogs and cats can sometimes get fleas or get into a mess that leaves their fur greasy. Using a mild dish detergent like Dawn can help get rid of the fleas and grease. Just be sure to only bathe them with the soap on very rare occasions, that you get all the soap rinsed out, and that you keep it away from their ears, nose, mouth, and eyes. 6. Carpet cleaner. With multiple cats and hairballs happening, I like to clean our carpets with a carpet cleaner at least every few months. Buying carpet cleaner can be expensive and it goes quickly. As such, I like making my own with hot water, dish soap, and peroxide. As always, be sure to test the cleaner on a small hidden area of your carpet to make sure the color doesn’t change. 7. Cleaning hairbrushes and combs. I love my long, thick hair, but it can do a number on my brushes and combs before I even realize it. Mixing some dish soap in hot water and letting the brushes and combs sit for several minutes before a thorough rinse is a great way to get rid of all the build-up. 8. Get rid of fruit flies. There’s just some produce that tastes better when you don’t refrigerate it. Unfortunately, that means you’re likely to have a fruit fly infestation now and then. To get rid of them, I like to make a small bowl of soapy water that I add a bit of flat soda or wine to. The sugar attracts the flies while the detergent makes them unable to fly back out. 9. Cleaning cabinets and appliances. The kitchen is the center of many family homes, which means it can also get quite dirty. Not only will dish soap get those dishes sparkly clean, but you can also wash all those food spills and drops from the exterior of your cabinets and appliances like the fridge and stove. 10. Protect your plants from insects. I’ve been lucky in my gardening adventures to not have to really worry about insects taking over the plants. But, I’ve heard several times that dish soap mixed with water in a spray bottle and lightly sprayed on your plants can help keep insects at bay. Just make sure to keep the concentration really low, such as 1 tablespoon dish soap to 1-gallon water or you could end up harming the plant itself. 11. Eyeglass Defogger – Put just a drop on the outer part of your eyeglass lens and rub over the surface. Wipe, but do not wash, it off and you should have a thin film left behind that will keep them from fogging up but that you can still see through. 12. Clean a blender in seconds. Whether you like making a morning smoothie, homemade dressings, soup, or all the other things a blender makes easy, you know that it can be a pain to clean. Sure, most can go in the dishwasher these days, but it will dull your blades faster over time. Instead, all you need to do is fill your blender about halfway with warm water and a drop of dish detergent. Run it on high several seconds, pour out the water, and give it a thorough rinse for a clean blender in seconds. 13. Check for air or gas leaks. Finding where the leak is in your tire, air mattress, or making sure your gas line connections are tight can be tough. While these things should ultimately be checked by a professional, you can also do a quick check yourself by applying some soapy water over the area. Wherever you see bubbles form, you know you have a leak. 14. Clean dried paint brushes. I’m really bad about doing a big project and then saving the cleanup for later, even though I know it makes cleanup more time consuming and difficult. Cleaning up dried paint brushes is no fun, but soaking them in some hot, soapy water certainly helps break up the paint again to make them easier to clean. 15. Make a homemade ice pack. Various sprains and strains are inevitable now and then. Instead of ruining a bag of frozen peas, if you’re like me and never remember to buy an ice pack, you can make a homemade ice pack. Just fill whatever size zip top storage bag halfway with Dawn dish soap and freeze. I like using freezer bags as they are a bit thicker, and you can also double bag to help prevent leaks. By using dish soap, the pack stays cold but still flexible so you can really wrap it around the strained area. As you can see, there are a lot of great uses for dish soap other than just washing dishes. Dish soap is really relatively cheap compared to a lot of other cleaners out there, which is just one of the many reasons I love using it so much, but right now you can get it for super cheap during Walmart’s April Stock Up & Save Event. 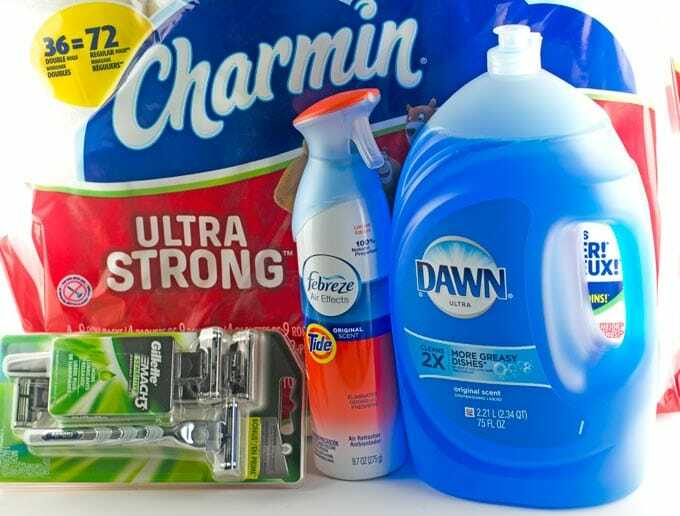 In addition to my beloved Dawn Dish Detergent, you can also find deals on everyday products you love like Bounty Paper Towels, Pampers, Febreze Air Effects, Charmin Toilet Paper, and more. Head over to StockUpSave.com or your local Walmart store to see all the savings you can enjoy just in time for spring cleaning. I love stocking up on cleaning supplies this time of year to last us all year long. 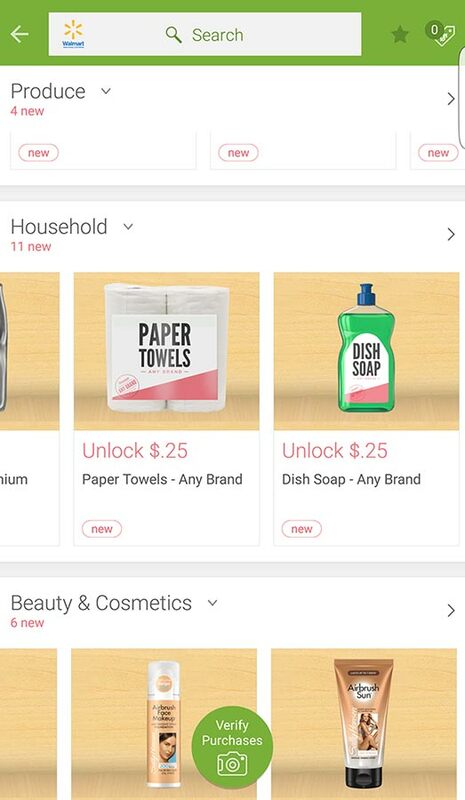 You can currently save even more by using one of my favorite money-saving apps, Ibotta, with their P&G rewards. If you’re like me and it sometimes seems like a miracle you have your head on straight because you have so much going on, you might want to head over to Facebook and sign up for the April Stock Up & Save Event so you have reminders before it ends. Do you have any other neat ideas for ways to use dish detergent? If so I’d love to read about them in the comments below!